An interesting question from a young member in our forum: it asks about investing now and enjoying later. I am 23 years old, I was 22 when I joined stocks. Do you think I did the right thing? Maybe in this group, all will say ‘definitely yes’ . But I don’t think so for those people out there na ka age bracket ko lng. I know I am doing the right thing, pero everytime kasi na nakikijoin ako sa mga gimmick with my friends e I felt like I was being out of place. Minsan inopen ko ang topic about stocks nung nag iinuman kami pero sabi nila ‘we are too yoing for that, ENJOY LIFE’ . Sa isip ko, I’m enjoying my life naman pero I don’t know kung naaayon sa age ko ang way ng pag enjoy ko nung life. Di ako kasi gaya ng iba na lage gumigimmick, once in two months lang siguro ako kung sumama sa shot session. Kaya yun. I am spending more time sa work and reading things about stocks and business. So, is there anyone out there na ka age ko at magkalapit lng ng age? Anu masasabi niyo? You can check the whole thread here. Lots of insights you can get. 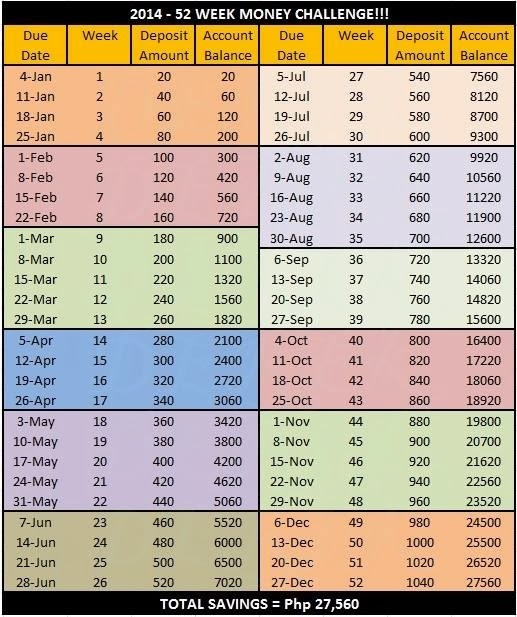 Now, if you’re totally new and you;ve not yet started saving, take the 52 Money Challenge instead. How about you – what’s your story? They say hindsight is 20/20 vision. Learn from others. And to help you begin, read this first – My Maid Invests in the Stock Market… and why you should too! Download it for free. PS2:This blog now has dedicated pages for click-by-click tutorial for beginners. If you have a relative or a friend whom you want to introduce to the world of stocks investing, you can direct them to below easy-to-follow tutorials. Even grade-school children should understand that, so konting kalabit mo na lang kelangan. Help them realize what they’re missing and they will thank you for that in the future. I started doing forex trading at 19 and will be doing stocks at 21. mdmi din ako kakilala who does better at a younger age. andun nga lng ung mukha kang laging tanga to open this up lalo na kung iba field mo, like in my case healthcare. but there's what we call choices, and we are entitled to it. One day I just met the people that would fit in , people that would be really of help. It took time but its worth it. You can attract people of same mindset, they maybe not everywhere, but they are just there, alive ,kicking and investing. and in my case, TRADING. 😛 thats how we innovate the world, the younger we are, the better.